How do you get Logo's? Hello, I am new here and was checking the site out. I was curious on how you achieve logos or do you have to earn them? I assume painting classes but is it possible to enter a doll already completed? Thanks for any help. Here are the current ways to get a logo with your nursery name/your name on them. Yes, you can enter a recently completed reborn in our monthly Artist of the Month (AOTM) Contest by sending the photos to me in a private message. Occasionally there are other contests (which also give logos). Recently there was a Spring Contest - with a 1st, 2nd and 3rd place finish - all received logos. You can also receive a logo for completing an on-line class. There is also a contest for the class members after the class is over (if enough participate) which is another logo! wow! we give a lot of logos!!! Very thorough, Jenny, as always!!!! jenny is our incredibly talented logo maker, by the way!!! I have learned so much from Lara's workshops, dvds, on-line classes and ebooks!!! (everything really!!). that's why I had only made one!! hehehehe (I didn't like my first one very much - lol). Then I found R.E.A.L. and really learned how to reborn!!! 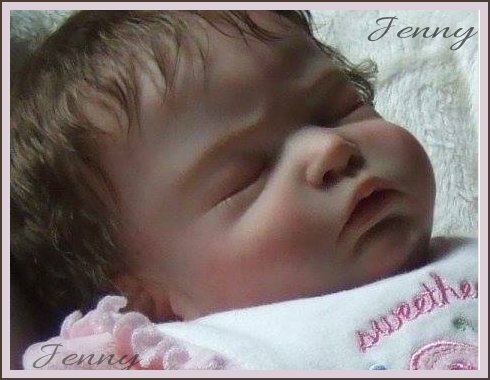 I only make a few reborns a year, but I do love this reborning art form so much!!! all the latest techniques -- another one pops up!!! I would like to get a logo, too.....can I enter my Summer Rain in something, I just made her. If you take an on-line class and complete the class you will also receive a logo. If there are enough class members that complete the class and want to enter a contest, there is also a logo for the winner of that! Do we send photos BY the 19th, or ON the 19th? The information you provided in this topic is very helpful, I hope you have more articles, I really need this information. At Topic, I was looking for a reputable address to supply materials to do. you need/like to have, to begin reborning. Subject: Re: How do you get Logo's?